This article is huge (50 pages) so I’ve broken it up into three parts. ONE AUTUMN EVENING in 1928, a new actor appeared at the Colony Theatre in New York in a movie called Steamboat Willie, the first cartoon ever produced with sound. He had ears bigger than Clark Gable’s, legs like rubber hose, a grin wider than Joe E. Brown’s, and a heart of gold. His name was Mickey Mouse. Beginning that night, Mickey and his creator, Walt Disney, grabbed the world’s funny bone and have never lost their grip. “A wow!” cried the Weekly Film Review. Thus was born history’s most influential mouse. Mickey led the way in the development of anima-tion as a new art, to the exploration of the world of animals and faraway people and of their adventures and geography. Mickey is featured in comic strips and books in 15 languages, became the star of television’s Mickey Mouse Club, and, finally, founded a magic kingdom called Disneyland. He is Topolino in Italy, Mik-kii Ma-u-su in Japan, Raton Mickey in Mexico, Micky Maus in Germany, Mikki Hiiri in Finland, and just plain Mickey in scores of other lands. He is known around the worldâ€”always with ap-probation and love. Mickey, a versatile fellow, has been everything from farmer and magician to great lover and fire chief. He has directed planets and comets in their courses. He has defied time, space, and gravity. But, though bound to win, he has always fought the clean fight. True to character, “Mickey Mouse” was the designation in World War II for diagrams of convoy movements toward Normandy’s D-day beaches, and Mickey rode into battles as the insigne on hundreds of ships and planes. Franklin Roosevelt demanded Mickey in the White House. Dowager Queen Mary of Britain liked to find Mickey on the bill when-ever she went to the movies. It can be said that Walter Elias Disney, the man, and Mickey, the mouse, have made a lasting impact on mankind. Last fall, in Walt Disney’s outer office at the studio in Burbank, California, I got a glimpse into the dimensions of this durable pair, 35 years after the mouse clicked in the fertile Disney mind. In cases ranged along the walls, on shelves and tables are some of the more than 700 awards the Disney organization has received (page 167). There are dozens of medals, citations, and plaques from appreciative governments attesting the international amity created by Disney’s make-believe characters â€”Mickey, Donald, Goofy the dog, and all the others. Walt once sent a proud director home with a newly won Oscar. “How did the family like it?” he asked next day. The awards from the film industry mean most to Walt. But he is proud that conservation groups have also recognized his interest in protecting wildlife. He is proudest, perhaps, of the Audubon Society Medal awarded in 1955. Although Walt constantly denies he is an educator, his nature films, which he calls True-Life Adventures, have received accolades from educators. Films like Seal Island, In Beaver Valley, and The Living Desert were pioneering achievements. Walt’s early edict for them and all the True-Life Adventure pictures was to get the complete natural history of the animals with no sign of humans: no fences, car tracks, buildings, or telephone poles. This concept, plus the intimacy, the extreme close-up view of the animal, completely won the public. The True-Life Adventures; films of the nomadic Blue Men of Morocco, Japanese fishermen, Siam, the Alaskan Eskimo, and Switzerland; Donald Duck’s adventures in Math-magic Land; the man-in-space series, with technical advice by Wernher von Braun; Disney safety films, and many others are a solid part of the curriculum for thousands of school children, not only in the U. S. but abroadâ€”including countries under Communist control. I first saw Walt Disney sitting at a low coffee table, wearing his usual working garb: a short-sleeved sport shirt with a woolen tie, slacks, and a sleeveless alpaca sweater. An aerial photograph of Disneyland dominated one wall. There were photographs of his family, including his five grandchildren; the Disney coat of arms; his first Academy Award. “That first Oscar was a special award for the creation of Mickey Mouse,” he said. “The other Academy Awards belong to our group, a tribute to our combined effort. The whole thing here is the organization. And the big problem was putting the organization together. “What’s your role?” I asked. Until a few years ago, Walt was president of the company, Walt Disney Productions. He resigned and was made board chairman. His older brother Roy became president. 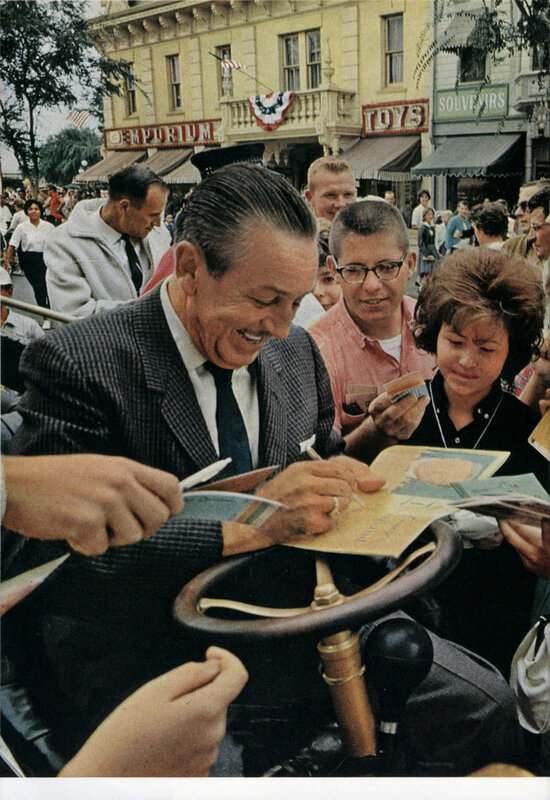 Then Walt, tired of signing things, resigned as chairman too. Walt laughed at the memory. “Now my only title is executive producer. I’m the boss of everything that’s produced here. I work on story ideas and gags; I work on every script, writing dialogue and planning scenes. When the story is set, I turn it over to the boys, and they make it. The corporation exhibits considerable vitality: In 1962 this magic world showed a gross income of $74,059,000â€”more than $20,000,000 from Disneyland aloneâ€”and a net of $5,263,000. All this vitality stems from a mouse that was conceived in desperation, gestated in secrecy, and almost died at birth. In the fall of 1927, Walt Disney returned to Hollywood from New York without a staff and without a star. He had gone east to negotiate a new contract for his series Oswald the Rabbit. His distributor refused to meet his price and threatened to lure his whole organization away. “I’ve already signed all your animators,” the distributor told Walt. Walt and Lillian Disney, his bride of two years, had a doleful trip across the continent. Walt needed a whole staff of animators. He also needed a new characterâ€”fast. In Hollywood, Walt and Roy Disney and chief animator Ub Iwerks, now director of technical research, began work on Mickey. The defecting animators were still at the studio finishing the Oswald contract, and Walt did not want them to know he was starting a new series. So Ub Iwerks was sequestered in a locked office, and there in four hectic weeks, he animated an entire Mickey Mouse cartoon. That first Mickey was entitled Plane Crazy, a bit of nonsense inspired by the Lindbergh flight. To get the drawings inked and painted on celluloid for the camera, Walt set up tables in his garage at home. There, Lillian Disney, her sister, and Roy’s wife Edna did the job. A cameraman returned to the studio at night to put the pictures on film. When Walt took the movie to New York, distributors were not interested. They were also not interested in a second Mickey, produced while Walt was traveling. Mickey was close to death. But he was literally saved by the bellâ€”bells, whistles, plinks, and toots. Sound had made its first real impact on motion pictures with the release of The Jazz Singer in the fall of 1927. Walt decided to try it. He and Iwerks rigged a homemade radio with a microphone. They put up a white sheet as a screen and, with two helpers, stood at the mike behind it with noisemakers, a mouth organ, and a xylophone. For six hours, Roy projected a short bit of animation from Steamboat Willie, the third Mickey film. The sound makers watched the image and whanged away. It was ragged, but it convinced them that sound was for cartoons. Walt hurried to New York with the film, and there Steamboat Willie was completed with sound. And it was ingenious and funny sound which transcended the mere novelty of actors singing or mouthing lines. Sound was added to the first two Mickeys. Suddenly and dramatically, evervbody wanted the talking mouse. Walt and the mouse have come a long way since. Nothing about Walt Disney’s background easily explains his success, though he began to draw at an early age. His father, Elias Disney, was a carpenter in Chicago when Walter Elias Disney was born there in December of 1901. When Walt was four, the familyâ€”there were three older brothers and a younger sisterâ€”moved to Marceline, Missouri. Walt still recalls the horsecar ride to the railroad station. At Marceline, one of Walt’s first chores was to herd the pigs on the family farm. The Disneys were forced to sell the farm, and in 1910 moved to Kansas City, Missouri. There Walt’s father bought a paper route with 800 customers. Roy and Walt were delivery boys. They started work at 4:30 in the morning and made their rounds on foot. The family moved back to Chicago in 1917. Walt went to high school, attended the Academy of Fine Arts, and took correspondence courses in cartooning. He also worked at the post office sorting mail and delivering letters. When Walt was 16, he joined an American Red Cross unit as an ambulance driver, but he did not set overseas until after the Armistice (page 163). He had 11 months in France, then went to Kansas City and set up as a commercial artist. He finally landed with the Kansas City Film Ad Company in 1920, preparing animated commercials for silent-movie houses. In 1923 he went off to Hollywood with $40 in hand, and for two months tried to hitch on at the studios. His $40 disappeared. “Before I knew it, I had my animation board out,” Walt recalls. He finally got an offer for twelve cartoonsâ€”Alice in Cartoon-landâ€”at $1,500 each. Business was good. Alice was followed by the successful Oswald the Rabbit series. Then came Mickey. “The mouse gave us an opportunity to improve the cartoon medium,” Walt says. Experiment and expansion began in 1929 with the first Silly Symphony, in which music played a key role. Walt’s next enthusiasm was Technicolor’s new three-color process for film. A Silly Symphony, Flowers and Trees, was already fully photographed in black and white. Walt decided to remake it in Technicolor. It was a gamble, since Technicolor was extraordinarily expensive. The picture was made in color and caused a revolution in the animated-cartoon industry. In 1932 it became the first cartoon to win an Oscar. Some of Walt’s funniest pictures were Silly Symphoniesâ€”notably The Three Little Pigs and The Tortoise and the Hare. In 1934 Donald Duck made his first sputtering appearance in The Wise Little Hen. That egregious fellow became an immediate hitâ€”and now has surpassed Mickey as the star of the stable. What “we would eventually do” was Snow White and the Seven Dwarfs, the first feature-length cartoon. When word of this project got around Hollywood, many movie people said Disney was making his biggest mistake. While his artists were training, Walt had technicians working on a new kind of camera he planned to use for Snow White. He was no longer satisfied with just round figures; now he wanted the illusion of depth. To achieve this, he developed the radically different “multiplane” cameraâ€”and won an Academy Award for it. In photographing animated films, three separate drawings are usually involved, each done on a sheet of transparent celluloid. One shows the foreground, one the animated figures, and the last the background. Before the multiplane camera, the three celluloids were simply stacked together and the camera shot through them all, giving a flat image. With the multiplane, more than three celluloids could be used, and they could be placed in different planes, sometimes as much as three feet apart. The camera could focus in and out among these planes to give an astonishing effect of depth and motion. Snow White cost one and a half million dollars, and the bankers became restive before it was completed. Walt reluctantly had to show a man from the bank the unfinished product to try to retain their confidence. “We needed a quarter of a million dollars to finish the picture, so you can guess how I felt. After Snow White came other feature-length cartoons: Pinocchio, Fantasia, and Bambi. Fantasia, released in 1940, started out to be a kind of super Silly Symphony for Mickey Mouse, with Leopold Stokowski directing a full orchestra in The Sorcerer’s Apprentice. Walt built it into something more, a brilliant combination of animation and fine musicâ€”from Beethoven’s Pastoral Symphony to Stravinsky’s Rite of Spring. Fantasia introduced stereophonic sound 15 years before it was generally used in motion pictures. Walt introduced live animals into the studio, deer and rabbits and skunks. “But they were no good,” he says. “They were just pets. So we sent the artists out to zoos, and all we got were animals in captivity. Finally, I sent out some naturalist-cameramen to photograph the animals in their natural environment. But the war intervened: Walt Disney Productions became virtually a war plant for the duration. Disney training films for the Army and Navy, pictures for bond drives, and similar projects made an important contribution to our war effort. As one of his first postwar projects, Walt sent Alfred Milotte and his wife Elma to Alaska. They sent back miles of film. In the footageâ€”or mileageâ€”Walt stumbled on one of the great stories of nature: the saga of the fur seals coming up from the sea to crowded island beaches in the Pribilofs, there to calve and mate. The Milottes caught the cruel and mysterious reality of the fur sealâ€”the courting and mating, the fury of the bulls defending their harems against bachelor seals, with babies being trampled and crushed in the turmoil. And, in the end, the eerie disappearance of the herds into the sea. The picture was Seal Island. It won an Oscar as 1948’s best two-reel subject. This success was followed by another, In Beaver Valley. Walt will go to the nth degree to get perfection, and for this film he kept cameraman-naturalist Milotte in the wilds for more than a year, studying the beaver’s life habits as he photographed. Out of Milotte’s footage came the story of a talented, fascinating animal (page 175). The True-Life Adventure pictures used techniques learned in cartoons. “Any time we saw an animal doing something with style or personalityâ€”say a bear scratching its backâ€”we were quick to capitalize on it,” says a Disney writer. “Or otters sliding down a riverbankâ€”humorous details to build personality. The cameramen spent months in primitive areas, in African heat, in Alaskan blizzards, in South American jungles. A film by Murl Deusing for a National Geographic Society lecture formed the basis of many important sequences in Nature’s Half Acre, and many of the Society’s lecturers over the years have contributed footage to Disney nature films. Disney’s cameramen-naturalists worked with telescopic lenses, zoom lenses, time-lapse cameras, and underwater cameras; from behind elaborate blinds, high in the treetops, and from fixed platforms. Tom McHugh, photographing a buffalo herd for The Vanishing Prairie, found he could not get close enough, even with a telescopic lens. Then he remembered an Indian trick. He covered himself with a buffalo skin and sneaked in for close-ups. James Algar, the writer and director of The Vanishing Prairie, recalls being surrounded by the torrential rush of buffalo. Alfred and Elma Milotte spent almost three years in Africa photographing The African Lion. One of their notable sequences shows a rhinoceros bogged in a water hole, helpless and raging. The, exer-tions and grunts of the doomed rhino attracted an audience of jungle creatures. Birds added their raucous cries. Antelope watched. An elephant surveyed the scene, panicked, and ran away. A baboon sat on the bank thoughtfully, as though trying to contrive some plan that would be of help. In the film the rhino was left to die. Actually, the Milottes decided to rescue him. Dodging the desperate animal, they got a stout rope under his head and rump, tied the line to a truck, and pulled him free. The rhino was ungrateful. Once on dry land, he charged the truck, and they barely managed to get away. The Milottes brought back much distinguished footage. They recorded a leopard lurking in a thorn tree above a herd of wildebeests, showed him drop on a calf and drag it back into the tree for his meal. Thev also filmed the kill of an antelope by a lion. Other outstanding film records were produced by Disney’s naturalist-photographers: a bobcat in hot pursuit of a marten; the private lives, births, mating, and the search for food of the pine squirrel, golden eagle, raccoon, and crow; a goshawk striking a flying squirrel in mid-air. They also recorded a goshawk slamming into photographer Paul Kenworthy’s shoulder as he worked high in a tree to film close-ups of its young. As the technique improved, the photographers worked in compoundsâ€”sometimes as big as 50 acres. “It was a short cut” a writer told me. “We’re not faking nature. We gave the animals the opportunity to appear before the camera. “Take the spectacular shot of the screaming bobcat scrambling to the top of a saguaro in The Living Desert. It may have been taken in a compoundâ€”but it wasn’t faked. The cat streaked up that cactus because he was frightened by wild pigs. Merely documenting the lives of wild creatures was not enough. The cameramen’s footage contained drama, but it took the dramatist’s hand to make it coherent. “In sequence where tortoises are courting, Walt said: They look like knights in armor, old knights in battle. Give the audience a music cue, a tongue-in-cheek fanfare. The winner will claim his lady fair…. “Pepsis wasp and tarantula sequence: Our heavy is the tarantula. Odd that the wasp is decreed by nature to conquer the tarantula. When her time comes to lay eggs, she must go out and find a tarantula. Not strength, but skill helps her beat Mr. Tarantula…. Walt has an amazing capacity to dramatize his work. When he is in a story conference, he takes the parts himself. Before Snow White he gave a four-hour performance of the entire picture, taking all the parts from Snow White to the smallest rabbit. Next Walt Disney laid plans for a new kind of animal picture. “We decided to combine nature’s truth with fiction,” Walt told me. Perri, the story of a squirrel, by Felix Salten, who also wrote Bambi, was the first of these. Naturalist-photographers spent three and a half years in the Uinta Mountains of Utah, filming the life cycle of every animal in the cast. They sent back more than 200 miles of film! Petri was followed by a continuing series of similar pictures that tell stories about animals in relation to man. “The animals have names and we kind of pull for them,” a writer told me. “Stories are believable as long as-the audience knows the things actually happened. We have to contrive to get the animals to do what the plot calls for without their appearing to be trained animals. But we aren’t asking them to talk. “In The Legend of Lobo, for example, the script called for the main character, the wolf, to walk a narrow log spanning a deep chasm. This was achieved by training the wolf, first to walk across a log near the ground, then to continue to cross the log as it was raised higher and higher. From animal pictures Walt Disney has gone on to live-action pictures about people on an astounding variety of subjects. The geographic scope and variety of the Disney activities are awesome. Besides a com-pany in the Burbank studio filming a new movie called Summer Magic, Walt had camera crews in Florida, Yellowstone Park, and New England, a complete production unit in Canada for The Incredible Journey, a production unit in Majorca and another in Vienna, a feature cartoon in the works, plus four television cartoons, and a Western being shot at the studio ranch. I had been told that Walt makes all major decisions on all his pictures, and I wondered how he kept track of things. I found out when I sat in with him as the “dailies”â€”excerpts from various picturesâ€” were projected. About fifteen of the staffâ€” musicians, directors, song writers, producers, and writersâ€”came in. We listened to Burl Ives sing “The Ugly Bug Ball” a dozen times as the camera covered him from different angles. Sad Sam, the original shaggy dog, appeared on the screen with a caterpillar on his nose. We saw a scene from a Western played over and over from different points of view. The dogs in The Incredible Journey went through their paces. Disney himself, in full color, flashed on the screen in a lead-in for his television program, The Wonderful World of Color. He began suavely and then blew his lines. We were in the projection room two hours. This, I learned, was how Disney keeps on top of his many projects. His men send their product to be appraised. A shipment of film from Europe arrives every Tuesday. Walt also makes frequent trips to Europe and flies key personnel to the studio for conferences. He is not a memo-writing man. On one of my first trips around the studio, I saw the National Geographic almost everywhere I went: in the animators’ offices, in the machine shop, on writers’ desks. I saw it in the wardrobe department, where it’s used in designing the correct clothing for various countries, and in the staff shop at Disneyland, where the realistic animals are cast for Adventureland. “Looks like I planted them,” Walt said, “but we really use the Geographic. We couldn’t be in business without it” (page 174). 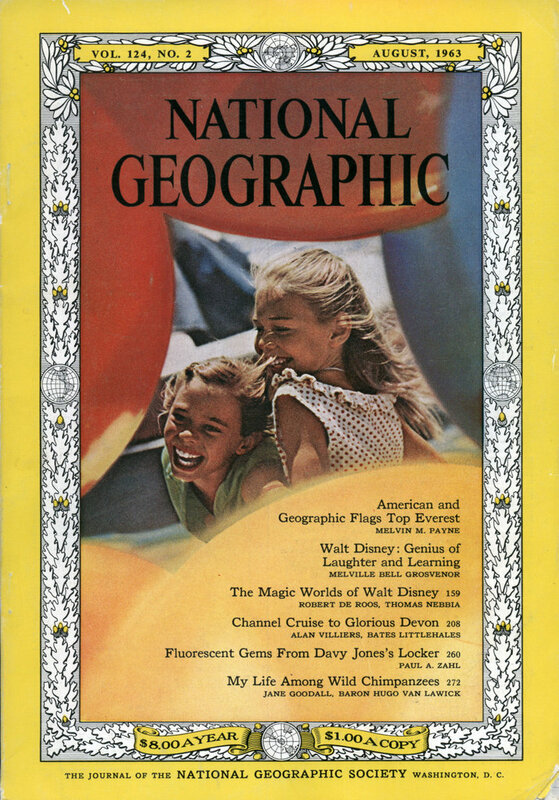 When I dropped into the library to inquire about the meticulous research that backs up every Disney picture, Koneta Roxby,the chief of research, told me: “The Geographic is one of our basic research sources. We use it almost every day. Disneyland really started more than 20 years ago, when Walt got the idea for an amusement park that grownups as well as children would enjoy. In 1954, for the site of his kingdom, Walt bought 244 acres of landâ€”mostly orange grovesâ€”25 miles from Los Angeles, near Anaheim, California. “I wanted flat land that I could shape” he said. When the preliminary plans for the park were completed, the cost estimate was $4,700,000, but Joe Fowler, who is in charge of Disneyland, says, “That was only a guess.” The over-all cost to date is approximately forty-four million dollars! At the Disneyland opening, in July, 1955, a year after the first orange tree was uprooted, Walt said, “Disneyland will never be com-pleted. It will grow as long as there is imagination left in the world.” It seemed, at the time, a pleasant sentiment, but few took it literally. Walt did, and that is why Disneyland remains unique; he is forever enlarging it (painting, pages 180-82). Now he is building an old New Orleans Square, complete with a bayou boat ride. Disneyland, on a fall day, is full of warmth and zest. I paid my respects to the giant portrait of Mickey Mouse, in living flowers, that adorns the slanting earth embankment at the park’s main entrance. I stepped into the Town Squareâ€”and right into Walt Disney’s childhood: The Square with its red-brick Victorian elegances is a distillation of Walt’s early memories of Chicago and Marceline and Kansas City shortly after the turn of the century. Main Street, U. S. A., sets the tone and pace of Disneyland: It is a place for strolling (page 187). People stop to peer into the windows of the apothecary shop and the old-time general store, and to look over the shoulder of a sidewalk artist as he sketches a portrait. Most of the visitors are grownups. As the park statistics prove, adult guests outnumber children three and a half to one. At the end of Main Street, faraway jungle noises made me turn to the left and enter Adventureland. I took the jungle river cruise (pages 192-3) aboard the sturdy river boat Ganges Gal, which chugged past menacing crocodiles, a ruined temple, and a group of bathing elephants. Gorillas and a tremendous African elephant roared from the tropical vegetation which choked the banks of the stream. There was some discussion among the passengers about the animals. Were they real? (They were, of course, animated.) But in Disneyland, it is sometimes hard to know where fantasy ends and reality begins. A little later, I watched a pair of ladies peer intently at the live swans sailing on the moat of Sleeping Beauty Castle. “They are not real,” one lady finally said with authority. I met Bill Evans and Ray Miller, landscape architects for the park, and complimented them on the effects they have created along the jungle stream. They have made Disneyland a must for visiting horticulturists. The park has close to 700 species of plants. It takes at least 30 gardeners to keep them in trim. We wandered to the base of the Swiss Family Tree House, which opened last fall. I asked what kind of tree it was. The 70-foot tree is a copy of the Swiss Family Robinson’s tropic domicile, complete with furniture salvaged from their ship. I took a short cut through Frontierland (pages 183-5) just in time to be caught in the middle of a running gun fight between a rootin’-tootin’ sheriff and a Western bad man. Happily, they were using blank cartridges, or the slaughter would have been awesome. The Mark Twain, the stately white river packet, was just leaving her dock for a cruise on the Rivers of America. Across the water, I saw some energetic boys romping on Tom Sawyer Island, while others helped Indians paddle war canoes or rode the high-sided keel boats, the ones used in Disney’s Davy Crockett movie and television series. In Fantasyland (pages’188-9) I found myself face to face with larger-than-life-size impersonations of famous Disney characters: the Big Bad Wolf, one of the Three Little Pigs, Minnie Mouse (page 202). The Mad Hatter, his rubber jowls quivering, was trapped in a corner. He was having a hard time defending himself against a mob of children. In Tomorrowland, I boarded the submarine Skipjack, one of eight submersibles in the Disney fleet. It took me on one of the incredible journeys of the world, though it was made in a mere six million gallons of water rather than an ocean. The sub “went under” in a swirl of bubbles and sailed serenely (guided by sonar, the skipper said) through treacherous coral reefs ablaze with animated tropical fish. Giant turtles dined on sea grass. Barracudas, sharks, and a dangerous moray eel loomed from the shadows. In a plunge to the abyss, we saw phosphorescent creatures of the deep. We passed through the hull of a sunken ship and glimpsed chests filled with gleaming treasure. And, as the skipper explained that we could not expect to see mermaids since they were only figments of imagination, we nosed impolitely into a mermaids’ boudoir (opposite). The sub visited the lost continent of Atlantis, went under the polar ice cap, and finally passed what may be the largest sea serpent in the world. Certainly the largest cross-eyed sea serpent. Fowler has one besetting problem: “Almost everything we undertake in the park has never been done before,” he told me. He cited the Matterhorn as an example (pages 194-5). The 146-foot-high mountain, which is one hundredth the height of the real Matterhorn, contains 500 tons of structural steel, and almost no two pieces are the same length, size, or weight. The Disney Matterhorn is a close copy of the real mountain. Disney designers studied hundreds of pictures of the rugged peak, pictures taken during the filming of Third Man on the Mountain. Like the original, it also has its mountain climbers, athletes in alpine attire who scale and rappel it eight times daily. Whereas the real Matterhorn is extremely solid, the Disneyland version is hollow and houses an exciting bobsled ride. I rode one of the bobsleds and was lifted high inside the mountain. Then my bobsled dipped over a sharp edge and I was on my ownâ€”moving around curves, through icy grottos, past waterfalls, and under the Skyway’s ski-lift buckets, which take visitors through the mountain for a view of the ice caves. Finally my bobsled dashed into a tumbling mountain stream, which braked it, and the ride was over. is the Disneyland-Alweg Monorail System which loops in and out of the park (page 197). Disney and Alweg engineers collaborated in the design, and the trains were built at the Disney studio. The monorail is the first of its typeâ€”a “piggy-back” design in which the cars are locked to the track. I rode the monorail from the Disneyland Hotel to the park several times. A uniformed girl handed me aboard the long silver train. It started gently, smoothly. We glided over the magic kingdom at 20 miles an hour, silently surveying the wonders below like some satellite from space. Most passengers, myself included, leave the monorail convinced it is the answer for rapid transit of the future. I wandered backstage at Disneyland to visit Bud Washo, the head of the staff shop. There I got a glimpse of the Disney future, though its subject matter in this case was the dim past. At WED Enterprises in Glendale, where all the design work for Disneyland is done, I had watched Blaine Gibson modeling a series of small-scale dinosaurs, cave men, and other prehistoric creatures. Now Bud Washo took me into a barnlike room where Gibson’s dinosaurs were being re-createdâ€”life-size. An enraged Tyrannosaurus rex with a two-foot mouthful of six-inch teeth is something to stand besideâ€”even if it is just clay. “Hardly anything affects it,” Washo said. When the casts are finished, the figures are trucked carefully to the studio machine shop, where their animation machinery is installed (page 203). “It will be able to swish its tail from side to side, open its mouth, flex up and down like a lizard, and the sail will sway,” Washo said matter-of-factly. “Where will the dinosaurs and cave men be used?” I asked. “They’re for the Ford Motor exhibit at the 1964 World’s Fair in New York,” Bud said. We walked in the bright sunshine between the stages on the movie studio lot and turned into the machine shop. Four elephants without skins sat in a row, gravely nodding their heads. On a bench lay what looked very much like a human hand, closing and opening silently. Farther down, a prehistoric man waved his arm; someone had incongruously placed a handkerchief in his hand. On the machinists’ benches stood a variety of plastic birds, opening and closing their beaks, turning their heads, and flipping their tails. Walt stopped to talk to a machinist. I looked at one of the birds. Without its feathers, the creature was a mass of wiring and air tubes. As I watched, this unearthly bird puffed out its chest and began to sing. A machinist told me that every bird contains five air lines and four sets of wires, plus a tiny loud-speaker. “It’s just animation with sound, run by electronics,” he smiled. “Audio-Animatronics. It’s an extension of animated drawings. “I don’t know anyone crazy enough,” Walt laughed. Several weeks later, Walt invited me to the studio for a showing of the completed mock-up for the Enchanted Tiki Room, scheduled to open in the park this summer. Now all the birds had been bedecked in colorful feathers, and were individually lighted. Four macaws opened the show with a line of chatter and then swung into a lively calypso number, followed by Offenbach’s “Barcarole.” A fountain jetted in time to the music under colored lights. “Let’s All Sing Like the Birdies Sing,” and brought down the house. There was much more: songs sung by orchids and bird-of-paradise flowers; a rain storm; chants by tikis â€”carvings representing various native godsâ€”accompanied by animated drummers. It is a tremendous showâ€”the climax of more than two years’ work at a cost of approximately a million dollars. I went out into the street again with Walt and Wathel Rogers, who supervised the Enchanted Tiki Room. We entered another building and I got a shock; I almost bumped smack into Abraham Lincoln! The illusion was alarming. The tall, lonely man sits in a chair much as in the Lincoln Memorial in Washington, D. C. But this is no cold stone figure; this Lincoln is man-sizeâ€”and so realistic it seems made of flesh and blood (pages 206-07). Wathel Rogers made adjustments at an electronic console, and Lincoln’s eyes ranged the room. His tongue moved as if to moisten his lips and he cleared his throat. Then with a slight frown, he clasped the arms of his chair, stood up, and began to talk in measured tones. “What constitutes the bulwark of our own liberty and independence?” he asked. To get an idea of the tremendous animation job this is, try it yourself. Sit in an armchair and pull yourself to your feet, observing how many muscles are called into play and the subtle balance required. The Lincoln skin is the same Du-raflex that has worked so well on the other Audio-Animatronic figures. Rogers described the mechanics: 16 air lines to the Lincoln head, 10 air lines to the hands and wrists, 14 hydraulic lines to control the body, and two pairs of wires for every line. Rogers ran the Lincoln face through some of its 15 expressions. Lincoln smiled at me (first on one side of his face, then the other). He raised each eyebrow quizzically, one at a time, then, fixing me with a glance, frowned and chilled my marrow. And just to show he wasn’t really angry, he ended by giving me a genial wink. “Lincoln is part of a Disneyland project called ‘One Nation Under God;” Wathel Rogers explained. “It will start with a Circa-rama presentation of great moments in constitutional crises. What next? Walt enjoys the past but he lives for the future. “I think about that,” he said. “Every day I’m throwing more responsibility to other men. Every day I’m trying to organize them more strongly.